(UnhappyFranchisee.Com) Yes, Revive Franchising, LLC Sito Marketing, LLC and the rest of the Revive Energy Mints gang have been sued by The FRS Company for infringing on the FRS trademark for HEALTHY ENERGY. 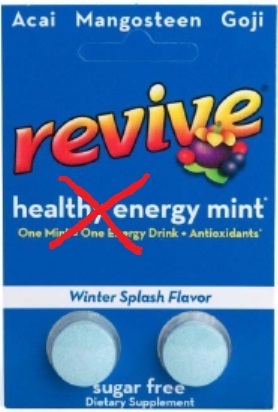 The lawsuit has resulted in a permanent injunction requiring anyone using the Revive Energy Mints to cease using the words “healthy energy” on their vending machines, product packaging, marketing materials, business cards, websites… or anywhere else… effective August 30, 2012. To our knowledge, neither Revive Franchising, LLC, Sito Marketing, LLC, Christopher Robertson, Michael Kelty, Bill Wotochek (now with Human Healthy Vending) nor their attorneys have even made the effort to even notify the distributors and franchisees who have been unable to communicate with the company since last year. What’s more, Revive Energy Mints franchisees and distributors can no longer use, display or sell anything that has the words “Healthy Energy” on it. That means just about everything. Here’s an excerpt from the Final Consent Judgment and Permanent Injunction document. You can read the full lawsuit complaint and Injunction by clicking the links at the bottom of this post. Plaintiff THE FRS COMPANY (“Plaintiff”) filed the Complaint in this action charging REVIVE FRANCHISING, LLC; RYLO PRODUCTS, LLC; SITO MARKETING, LLC d/b/a Revive Energy Mints; CHRISTOPHER ROBERTSON; and MICHAEL KELTY; (collectively referred to as “Defendants”) with federal trademark infringement in violation of section 32(1) of the Lanham Act, 15 U.S.C. § 1114; false designation of origin and unfair competition in violation of section 43(a) of the Lanham Act, 15 U.S.C. § 1125; trademark infringement under the common law of the state of California; and unfair competition under California statutory law. 1. This Court has jurisdiction over the parties and over the causes of action asserted in this action. Venue is proper in this judicial district. 2. Defendants do not contest Plaintiff’s claims that Plaintiff has continuously and extensively used the mark HEALTHY ENERGY in interstate commerce in connection with its goods since at least as early as January 2007, and has obtained extensive common law trademark rights in such mark (hereinafter the “Plaintiff’s HEALTHY ENERGY Mark”). 3. Defendants do not contest Plaintiff’s claims that, based on this widespread use, Plaintiff has established substantial goodwill in Plaintiff’s HEALTHY ENERGY Mark, and Plaintiff’s HEALTHY ENERGY Mark has acquired and continues to have secondary meaning. 4. Defendants do not contest Plaintiff’s claims that Plaintiff has valid and enforceable rights in Plaintiff’s HEALTHY ENERGY Mark. 5. Defendants do not contest that Plaintiff’s U.S. Trademark Registration No. 3,544,234 for its mark HEALTHY ENERGY is valid and enforceable. 6. Defendants have sold nutritional products using the name or mark HEALTHY ENERGY MINTS. Effective as of August 30, 2012, the following who receive actual notice of this Judgment and Permanent Injunction by personal service or otherwise are hereby enjoined: Defendants, its officers, agents, servants, employees, franchisees, distributors, and attorneys, and all other persons in active concert or participation with them. c. Passing off, or actively and knowingly assisting any third party in passing off, its products as being affiliated or associated with, or endorsed or sponsored by, Plaintiff. HUMAN Healthy Vending: the Next Revive Energy Mints Scam? ARE YOU FAMILIAR WITH THE REVIVE ENERGY MINTS, SITO MARKETING, CHRIS ROBERTSON, MIKE KELTY, OR BILL WOTOCHEK? SHARE A COMMENT BELOW.